The galaxy's favorite skittermanders are back and ready to help—but this time, they're the ones in trouble! After a successful salvaging mission, the heroes are riding a joyous high aboard their very own starship. However, angry space pirates with a grudge crash the party—and then a bizarre interstellar cyclone engulfs both sides' vessels and flings them into a strange world's atmosphere! Thanks to the help of a tiny mining vessel, the skittermanders are able to escape to this swampy planet. Once they take in their boggy surroundings, it's up to the furry heroes to track down their ship, avoid vengeful enemies, work with the sluglike scholars living in the muck, and find a way off this dangerous planet once and for all! In addition to this freewheeling adventure, this book includes four pregenerated characters that are ready to play, with full stat blocks and backstories. The inside covers include all of the maps needed for this adventure. Plus, the inside back cover provides some guidance for items our helpful skittermanders might have scavenged from their previous forays! 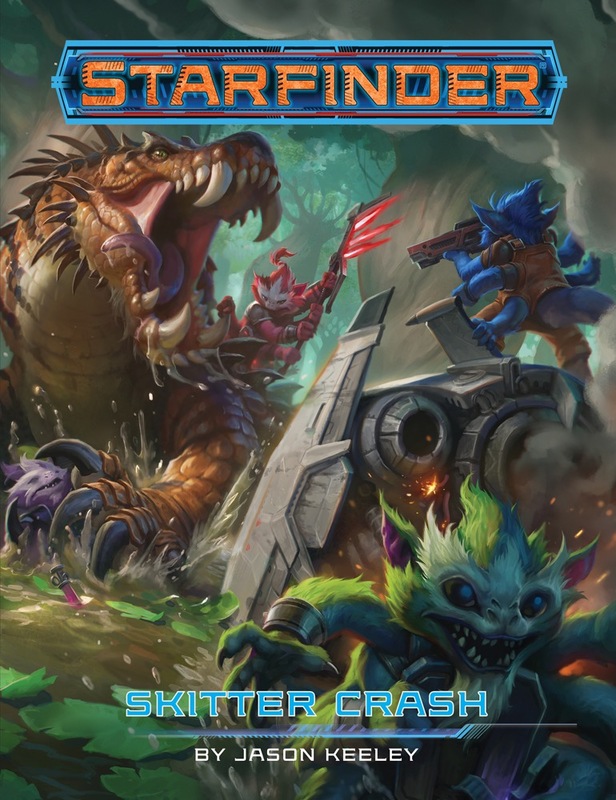 Skitter Crash is a wild romp of an adventure intended for four 3rd-level skittermander characters who are exploring and trying to escape a swampy world, written for the popular Starfinder Roleplaying Game. 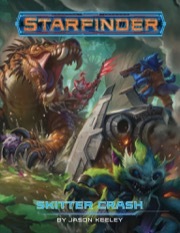 Release: This special 16-page Starfinder adventure was created for Free RPG Day on June 15, 2019. The print edition will be available for sale and a free download will be available on paizo.com beginning July 1, 2019. I really liked GMing "Skitter Shot" for two different new groups, i'll see if i do that again this year, with part #2 (of a trilogy i bet), even though my birthday is on the 16th. Yusss. I cannot wait to play this! It sounds like great fun. Great. Skitter Shot is great fun! So hyped. I'm also super curious about the chronicle sheet for this. Looks like this is going to be awesome! Can we get the pregens and chronicle sheets PDFs a bit earlier this year? For those of us running this as demos for Free RPG Day it was a bit of a scramble last year. Cannot wait for this one, I had a blast last year.